Newborn planets are difficult to observe because they are small, faint, and are expected to be heavily embedded in the primordial circumstellar material. In particular, the presence of a circumstellar disk rich in dust and gas makes most of techniques used to detect planets around old stars of scarce utility. Nevertheless, observing the first stages of planet formation is not hopeless! Actually, new instrumentation such as high contrast infrared cameras and long-baseline interferometers are opening unprecedented windows on planetary systems in the act of forming. 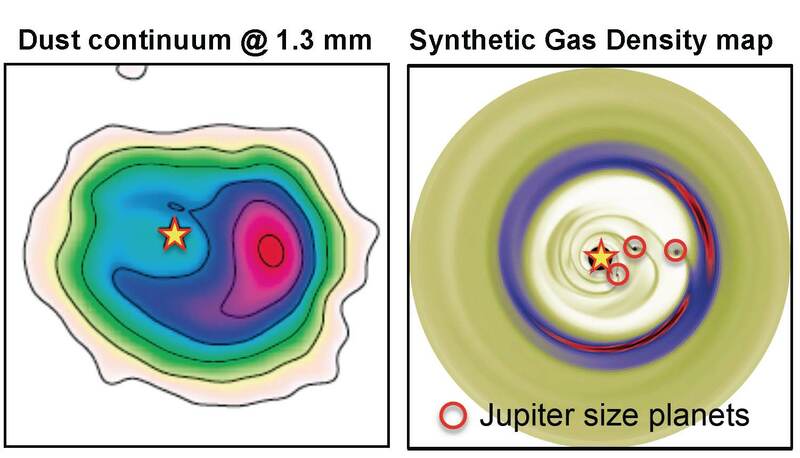 Giant planets are thought to gravitationally interact with the surrounding circumstellar material, leading to large scale density perturbations in the disk structure that can be observed by existing telescopes. The comparison between these structures and theoretical models for the disk-planet interaction might provide constraints on the mass and orbital radius of the embedded planets. As an example, the Figure on the right shows the emission from the warm circumstellar dust surrounding the young start LkHα 330 recorded at the wavelength of 1.3 mm with CARMA (left panel) and the simulated distribution of circumstellar gas in presence of three Jupiter-size planets orbiting between 10 AU and 50 AU from the central star (right panel). The qualitative similarity between models and observations suggests that this circumstallar disk might be indeed shaped by a planetary system in the act of forming. The number of circumstellar disks showing perturbations possibly due to yet unseen planetary systems is rapidly increasing (see our recent articles on this topics). However, there is still a lot of work to do to understand the effects of the planet-disk interaction on the disk emission, and, more precisely, on the emission observed in different tracers at different wavelengths.